LEG HEALTH DAY - FREE LEG SCREENING! Tuesday, May 15, 2012, 10am - 3pm. 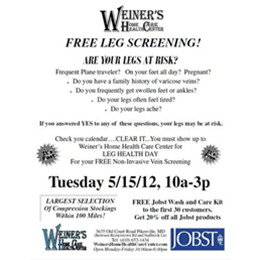 On May 15, a Jobst representative will be here, on-site at Weiner's, to do a FREE, non-invasive leg screening. Drive in your car constantly for long stretches? Family history of Varicose Veins? Or just plain tired, achy legs? If you answered yes, to any of these, your legs may be at risk. You need to come in for a leg screening to put your mind at ease. It is as easy as a blood pressure check. It's FREE, no obligations, no strings attached. The first 30 participants will receive a FREE Easy Wash and Care Kit for compression socks. AND get 20% off on all Jobst products for the entire week!